Description: An eastbound freight rolls past Camp 20 running wrong due to the single track project. Description: Train 570 rolls through Grand Crossing at sunset. Description: An freight heads east on the recently single-tracked main. Description: An eastbound freight rolls down the C&M Sub. to Chicago. Description: NS train 084 will shortly hand off to CP when it arrives in Buffalo, becoming train 262 and rolling for Binghamton and finally New Jersey with its 88 trailer flats. Description: Tioga Center was known for the pair of semaphores that were opposite each other at the Ayres Rd crossing a mile of so east of this location, and that was "the" shot there. I always loved the cormfield and hills, but the lighting didnt usually favor that shot, since the train was going to be dark almost all the time. I took advantage of one of the Southern Tiers many cloudy days to get 261 there in more even light. Description: An extra sectin of 261 ran this day with CP showing the new flag in the lead. This looks like a KL 1 combined with overflow cars from 261, as it had 36 stack platforms and 62 TOFC. Description: SOO 6026 and SOO 6051 lead the daily Humboldt-Northtown transfer on the loop track at Shoreham. 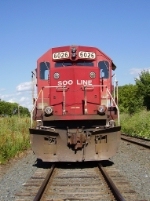 Title: A pair of SOO SD60's & a CP SD40-2 lead a train at CP's North Yard. The track in the foreground is NS's Souther tier main at William St. 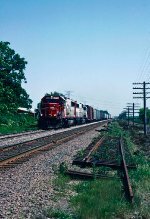 Description: My first picture of a SOO Line locomotive as it leads a grain train from Mt Pocono. Description: A pair of SD60s sit at Cardigan West waiting to be crewed to go to Humboldt. Description: The 6026 in charge of the Rock train idle with brethren 6039 at Victoria Street. Description: SOO 6026 West (Manifest Freight) rolls through the Duplainville Interlocking.